As far as I’m concerned, there’s nothing better for cholesterol and heartburn-inducing decadent indulgence than fried stuff covered in cheese, or even better, plain old fried cheese. As somebody who’s partial to things that burn my mouth, and later, other bits of me, chillies stuffed with cheese and then deep fried are one obviously one of my favourite things on earth. 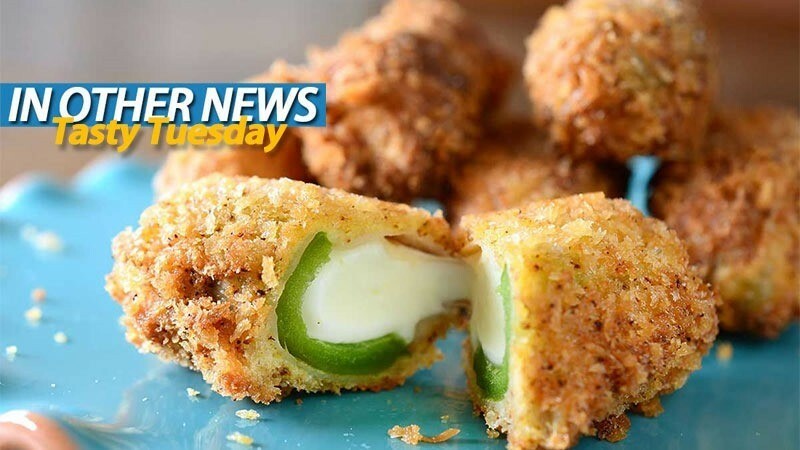 Here’s a picture of a mozzarella-stuffed Jalapeno popper. It should be in my face. What’s your favourite deep fried thing with cheese? In Other News: Master Chief need some master bandages, Disgaeioueaueaeaea 5 gets some gameplay, SEGA’s being a little stupid and Riot’s about to riot. Here’s the new we didn’t post because we were too busy listening to the second single from Britney Spear’s fourth studio album. Halo 5: What does this injured Master Chief image mean?